Wolfdown, Bites & Bashes, and Makani go beyond traditional bulgogi and bo ssam. Los Angeles is the best city in America for old-school Korean food, like the perfectly grilled barbecue, deeply flavorful stews, and many renditions of delightfully fatty bo ssam that you’ll find all over Koreatown. But Korean food is also an ever-changing cuisine that’s being showcased in modern neighborhood restaurants all over L.A. Here are three new spots that are exploring Korean flavors while bringing their own brand of 2018 funk. Wolfdown, located in a Silver Lake bungalow with a storied past that spans decades (there are rumors that comedy legends Laurel and Hardy and hard-partying band Korn lived here, obviously not at the same time), is an enchanting neighborhood restaurant. It’s a lively big-city hot spot in a structure that resembles a hidden woodsy cabin. To dine here, you walk up upstairs into the old raised house (which locals might tell you was once home to some wild music-industry parties) or a table on the patio. On the night we visited, there were was a table of four scenesters inside; they were discussing how they’ve wanted to visit this place for a while. There were fashionable couples on double dates, sipping sake and cocktails in between bites of fragrant steamed sea bass with myulchi gukmool (anchovy broth that’s stewed for hours). On our way out, we saw Nick Kroll pull up to valet. Our favorite dish of the night was a mushroom ssam that happened to be vegan. (Sometimes, this dish isn’t vegan, depending on which one of the half-dozen housemade kimchis Wolfdown serves with it.) The ssam is a plant-based delight that feels meaty and substantial, a lettuce wrap that bursts with flavor, texture, and the heft of grilled king trumpet and oyster mushrooms. The accompanying ssamjang adds tremendous umami and funk with its mix of gochujang and fermented soybean paste (doenjang) along with sesame oil, sesame seeds, scallions, and whipped silken tofu. Originally, he had doubts about opening a Korean-inspired restaurant because L.A. has such a vibrant Koreatown. It’s not dissimilar to the internal conflicts that pioneering Korean-American chefs Roy Choi and David Chang have had as they’ve taken Korean food to new places in America. But as some time passed at Wolfdown, Kim decided he was ready to put his spin on Korean food and not hold anything back. Make no mistake: What Kim wants to do and what he does extremely well is Korean-Angeleno food, which he’s been showcasing on a new menu that launched this year. Kim and new co-chef Susan Yoon (formerly at Bäco Mercat and 71Above) are serving dishes like crispy pork belly ddukbokki. Ddukbokki, chewy rice cakes in a sweet-and-spicy red sauce, is a popular street food in Korea. Kim and Yoon have made the dish their own by adding smoked tomato gochujang, crispy perilla seeds, and Armenian braided string cheese. The cheese, which Kim selected after also trying Oaxacan string cheese and fresh mozzarella, is a nod to L.A.’s diversity and Wolfdown’s proximity to Armenian communities. But the main reason the cheese is there is because millennials in Korea are obsessed with cheese right now. This is part of an insightful larger point Kim wants to make at Wolfdown. He and the Korean-born Yoon both grew up eating in L.A.’s Koreatown and realize that a lot of Korean restaurants are time capsules that represent the year they opened, whether it was in the 1970s, 1980s, 1990s, or the aughts. This means blending Korean influences with local produce and flavors from assorted cultures in exceptional dishes like silken tofu with cherry tomato, strawberry, puffed buckwheat, and minari vinaigrette, and crispy sweet potato with smoked soy tonnato, aonori, and Sichuan peppercorns. 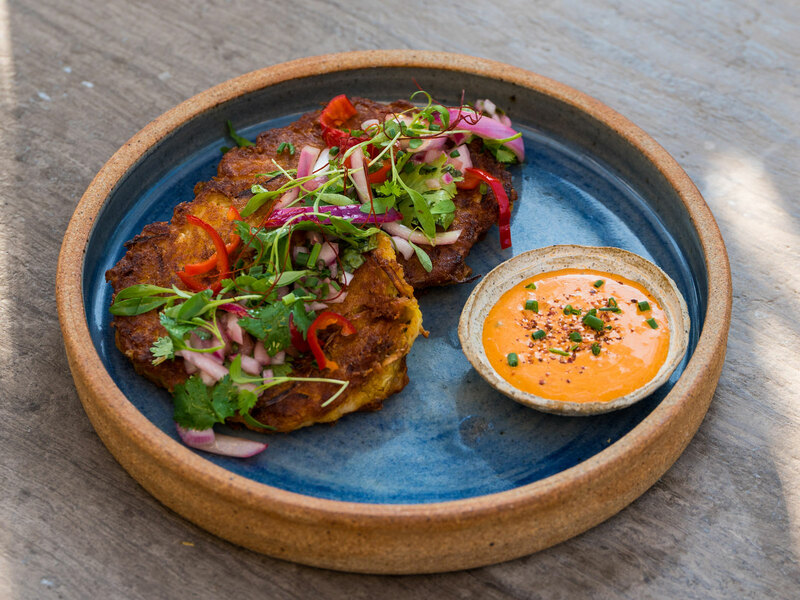 Bites & Bashes, an all-day café in the South Bay that grew out of an A-list catering company, takes co-owner Crystal Coser back to her L.A. childhood in many ways. Bites & Bashes, which opened in Lomita in June, doesn’t define itself as a Korean restaurant, so the word galbijjim isn’t on the menu. But the braised short ribs with carrots and smashed fingerling potatoes are what Korean-born chef Julie Coser has served her own family for decades. The only difference is that it’s plated as an elegant-looking entrée instead of being served family-style. Julie, who moved to Los Angeles when she was 20 and immediately started working in restaurants, also used to make bulgogi for Crystal and her brother Ryan’s school lunches. “We’d be so embarrassed to eat that at school that I would trade the bulgogi for Lunchables,” Crystal says. 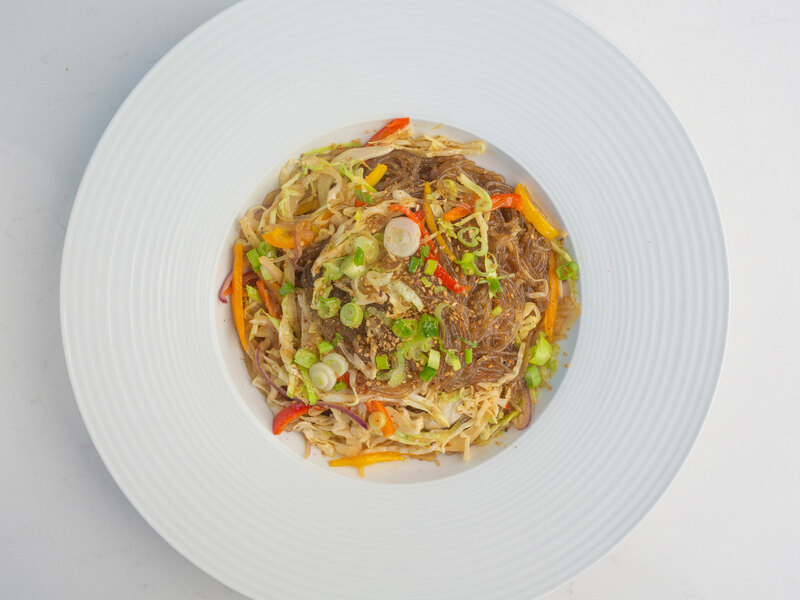 You can also get bulgogi alongside your order of otherwise vegan Korean glass noodles made with sweet potato starch. (This dish is japchae, of course, but that word isn’t on the menu either.) These hearty noodles come loaded with produce like mushrooms, carrots, scallions, bell pepper, cabbages, and bean sprouts. They’re also crowned with edible flowers from the Coser family farm, which is run by Russ Coser, also known as Dad. This is a family business in every respect. Russ is also growing herbs and all of the citrus for Bites & Bashes, where Julie will be rotating in seasonable vegetables for dishes like her glass noodles. And because this is an L.A. restaurant more than anything else, Julie is cooking without boundaries. Beyond Korean food, Bites & Bashes serves standout dishes like bright and earthy falafel sandwiches, rainbow hummus (a tray of three different kinds of hummus, made with beets, sweet peas, and cannellini beans), and a soul-warming spaghetti bolognese. That bolognese is what Crystal and Ryan ate often after school and before tae kwon do. Meanwhile, at Crystal’s urging, Bites & Bashes has put buttered penne on the kids’ menu. Growing up, Crystal, who started baking crème brûlées and souffles when she was in elementary school, didn’t watch cartoons or the Disney Channel. She watched the Food Network. She remembers being eight years old and seeing Emeril Lagasse make profiteroles on TV and crying to her mom: “How was I supposed to make profiteroles if I don’t have a KitchenAid?” Julie, happy to indulge Crystal’s interest in food, bought her a Kitchenaid mixer that Christmas. When Crystal was 15, she opened a catering business, C&J's Catering & Events, with Julie. Crystal later got into Harvard after writing an essay about how she started the company. She was a manager at the university’s Cambridge Queens Head pub while also being the chair of the Harvard College Events Board and taking classes like food science with Ferran Adrià and José Andrés. Then, after graduating and working in the events and food industries, Crystal (who is also the associate editor of Eater in L.A.) teamed up with her mom again and created the Bites & Bashes catering company in 2015. A lot has changed since Crystal was trading bulgogi for Lunchables, and a lot has stayed the same. This balance of old and new, of family history and a desire to modernize, is one reason Bites & Bashes is such a compelling restaurant. For example, what’s known as "Crack in a Cup" is a sweet, Asian-style coffee drink Julie’s been making for three decades. She used to make it with freeze-dried espresso, but Bites & Bashes is buying whole coffee beans from local specialty roaster Lamill and blending together Black Onyx drip coffee and Reservoir espresso. There’s no better way to start your day in this all-day café. Makani, featuring Korean-Angeleno chef Kevin Lee’s uncompromising food paired with tropical rum drinks at a buzzing indoor/outdoor space that attracts the attention of pedestrians and Bird-scooter riders, opened in May, and it has quickly turned up the heat on Venice’s chic Rose Avenue. This is a neighborhood where Silicon Beach entrepreneurs mingle with millionaire poker players and Goop-reading wellness obsessives. It’s also a neighborhood where people embrace delicious, creative food, so both Makani’s interior and patio were packed this past Wednesday with diners dipping raw and wood-fired seasonal crudité, like watermelon radishes and purple cauliflower, into ssamjang. We also enjoyed dipping puffed rice chips (nurungji) into spicy eggplant. There were multiple tables covered with excellent oyster omelets and mung bean pancakes (jeon). This is one of the best places in L.A. to share many items. When Lee says he thinks that “dining is an experience that you share together” and that it’s about “bonding and happiness,” you buy into his philosophy because his food is so tantalizing and fun. Makani’s skirt steak ssam with horseradish turmeric cream, scallion salad, perilla, and gem lettuce is one of those lovely dishes that manages to taste simultaneously familiar and original. Lee, who worked under Josef Centeno at both Lazy Ox and Bäco Mercat, understands the kind of flavor combinations that L.A. palates enjoy. Lee’s crispy duck confit, made with half an organic Pitman Farms duck, is served alongside kimchi-bacon rice that adds the ideal amounts of spiciness, salt, fat, and funk to the sizeable entrée. Lee was born in Korea. His mom was a talented cook who made Korean food but also pizza and pasta when he was a child. Lee moved to L.A.’s San Gabriel Valley when he was 16. He ate burritos and bánh mìs in L.A. and thought that they were American food. He befriended Chinese and Vietnamese teenagers in the SGV. He realized that L.A. is great because it’s a place that blurs so many of the lines all the time, and now he’s got a restaurant where he can serve clams with Chinese black beans, Mexican chiles, Thai basil, chicharrones, and wood-fired ciabatta. It’s a fantastic dish. So when you ask Lee how he describes his cooking, he’ll call it “Angeleno food.” Given where he was born, it makes sense that his menu at Makani (the word Makani means wind in Hawaiian, and it’s a term used to describe free spirits) skews Korean. But this is also a restaurant where you can come for braised lengua or lamb-and-beef skewers with curry lebni. You can enjoy classic tiki cocktails like a Painkiller and a Dark & Stormy or Makani creations like Another Broken Vow (mezcal, pineapple rum, habanero, rojo vermouth, and citrus). Whatever you do, you are at a restaurant that expresses so much of what’s wonderful about L.A. dining in 2018. Order a lot of food and share it with your friends or family. Soak up the freshness, fire, and fun. And maybe sit outside and enjoy how the wind’s blowing in Venice.